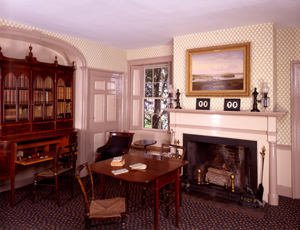 The sitting room of the Wadsworth-Longfellow House, 2002. In 1853 Anne converted the smaller front parlor into a sitting room for daily use, selecting an example of wallpaper found in New England's most fashionable houses. The room had served previously as a dining room from 1807 when the Longfellows furnished it with a handsome sideboard and dining tables. In 1815 it became Stephen Longfellow's law office and a new side entrance and vestibule were built to divert clients from the family's hall. Henry often found the entry a quiet place to read, write, and study. In November 1825 Stephen moved his office to Court Street, and the room was again remodeled for dining. The vestibule was converted for storage of china and housewares. Henry regretted that the little room he recalled so fondly had been transformed and wrote in a letter: "— no soft poetic ray has irradiated my heart — since the Goths and Vandals swept over the Rubicon of the 'front entry' and turned the Sanctum Sanctorum of the 'Little Room' into a China Closet." An innovative sideboard-bookcase, built by local furniture makers the Radford Brothers, dominates the room. With a center drawer that folds down to form a writing space, it ably served Stephen Longfellow in place of a more traditional desk. The sideboard's upper bookcase dates from 1815, and housed part of Stephen's extensive law library. Charles O. Cole's 1842 unfinished oil portrait of the poet and Eastman Johnson's charcoal drawing of Anne decorate the walls. According to Anne, her father accepted the French mantle clock as payment for services rendered by a cash-strapped client after the Embargo of 1807. The symbolism of the phoenix, which surmounts the clock, was not lost on the Longfellows, who helped Portland rebuild its Revolutionary War losses. Portland embraced the phoenix as its symbol in 1786. By the second half of the nineteenth century, Anne used the room for a multitude of purposes. She dined, met with family members, wrote letters, sewed, and entertained guests in a less-formal atmosphere than the parlor.